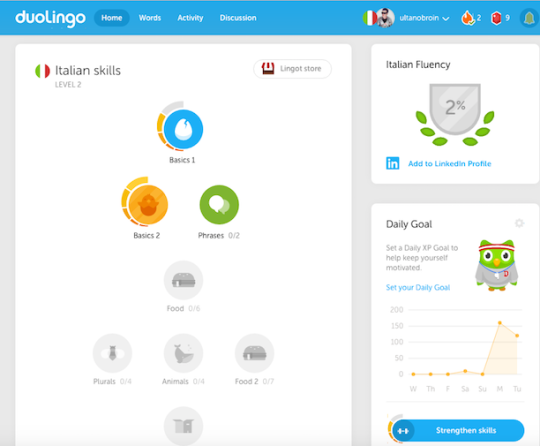 I’ve previously written for MultiLingual about the language learning app Duolingo. I recall Duolingo’s launch and remarking how it was yet another #haterzgonnahate moment for the language industry critics out there. They’ve been proven wrong again. Nothing new there with the blowhards. Just like with their Google Translate criticisms they don’t get it that the alternative is not a human professional translator charging users for money for top quality grammar, terms and style, but no language option at all. I also wrote about how my own national language, Irish (Gaeilge), is doing so well on the platform and receiving such high-level recognition. Exploring Italian on Duolingo. I think I will wait until I get a bit more fluent before sharing my skills on LinkedIn, but I like it! 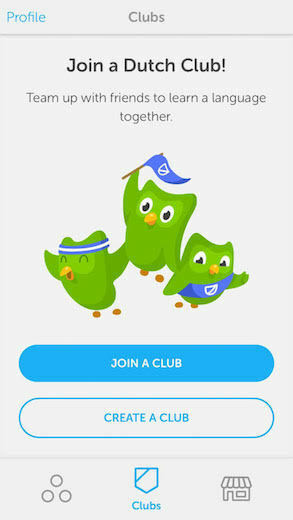 Social is a key part of the Duolingo experience. 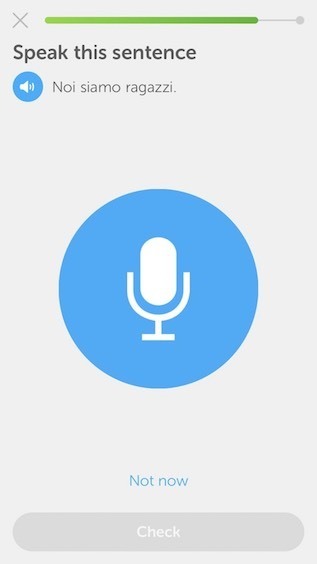 Duolingo takes advantage of voice-enabled devices of course, although it can be used without that feature. I mostly use Duolingo on my laptop and smart phone (language options in beta are not available on mobile), and have even tried it on Google Glass! Duolingo’s got it all going on really from a UX perspective. It’s free, fun, global, local, social, all about mobility from the cloud, includes gamification, is powered by the crowd, packs voice interaction, and now bots too. 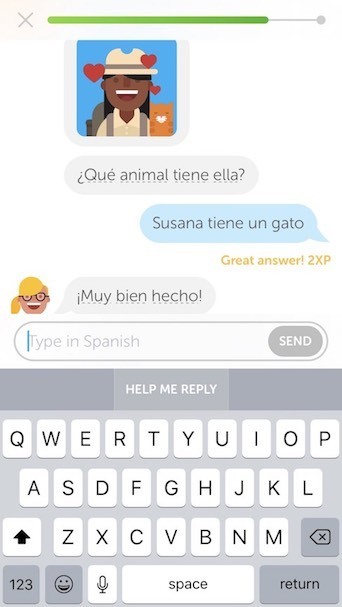 A bot is ideal for language learning conversational interaction, of course (though the bot feature is not available in every Duolingo language option). 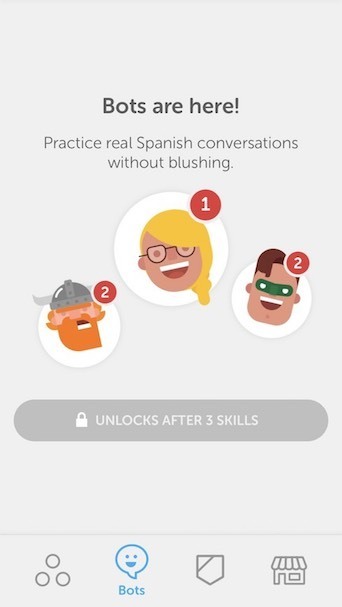 A Duolingo bot can be unlocked to practice your language skills “for real” after a certain level. Chatbots are an ideal way to engage with a languagelearning app, delivering a conversational UI for conversational solutions. Of course, text input and gestural interactions are also available. Duolingo is being used by so many people and for so many things! I know people who use it to learn French, German, Spanish, Italian, Vietnamese, Irish, Romanian, and more. This might be out of love of learning new languages, getting the hang of some phrases in advance of foreign travel, strengthening the kids’ school language learning, just wanting to converse with others in their own language on a more casual basis, or simply out of plain old curiosity. For many, Duolingo is the “only game” in town. This TED talk with Luis von Ahn about large-scale online collaboration will help you get your head around what Duolingo is about. But, honestly, the best way to experience Duolingo is to … start that conversation yourself Go for it! 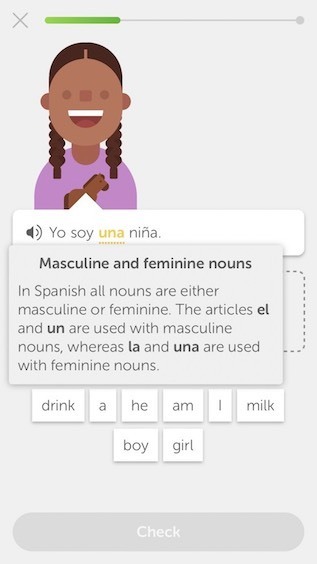 Duolingo explains as you learn: Noun gender in Spanish is covered as you use your own voice on a smartphone, for example. Hey kids, you talkin’ to me? Italian lesson with voice input enabled. 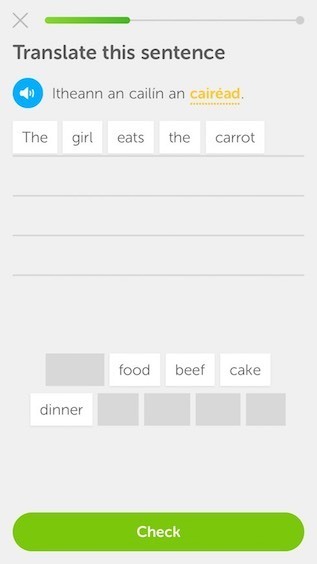 More carrot than stick with the Irish lesson. There’s a change! Listen and then drag and drop the words to translate. Nice! Activity stream showing my Duolingo progress. Hey You! Your friendly Duo reminder on the smartphone! Bring the Bitterballen. Learning with others can be fun too. 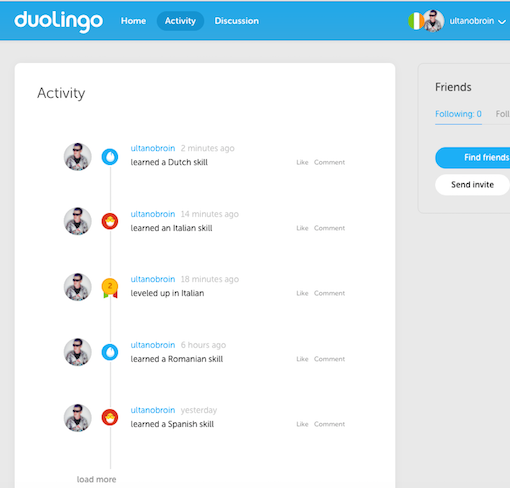 Duolingo lets you try group learning as well as learning on your own. 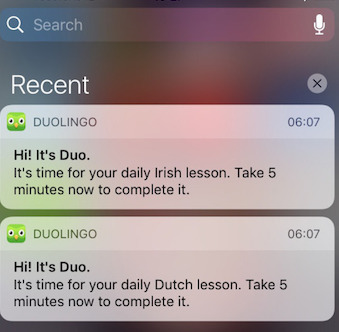 If you’ve used Duolingo, I’d love to hear about the experience: the why, how and what you felt about it. The comments box is open for your conversation. Ultan Ó Broin (@localization), is an independent UX consultant. With three decades of UX and L10n experience and outreach, he specializes in helping people ensure their global digital transformation makes sense culturally and also reflects how users behave locally. Any views expressed are his own. Especially the ones you agree with.